Peristaltic Pump Systems | EGM, LLC. A wide range of peristaltic pump systems have been fabricated by EGM for many different services including precise dye dosing, defoamer metering, liquid polymer metering, bulk fluid transfer, and tank recirculation. With OEM access to tube and hose pumps geared toward both industrial and municipal applications, EGM has the experience to properly accessorize the system pending the final installation use and requirements. Skid mounted systems can be built on frames constructed using TIG welded, tubular stainless steel, or systems can reside on custom thermos-plastic bases for use in situations where light weight, easy portability, or chemically resistant structure is needed. 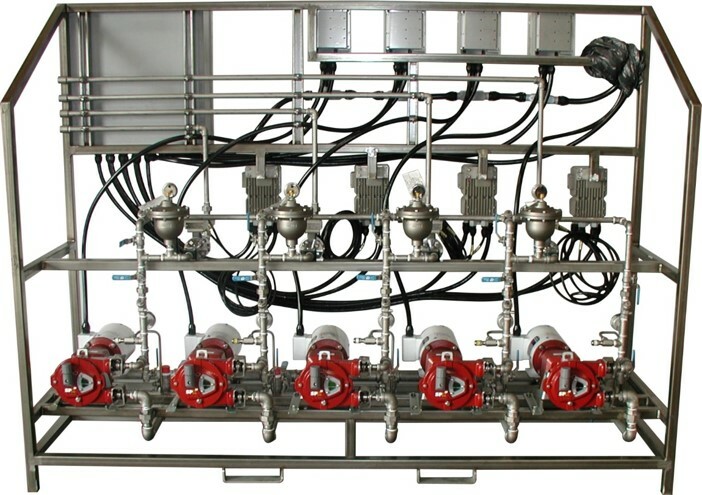 For systems that utilize digital dosing type pump technology, EGM can incorporate additional instrumentation and controls as needed to offer a turn-key metering pump system. For motor driven and larger capacity units, control panels with motor starters or variable frequency drives can be incorporated to meet end user requirements.